A mixed bouquet of flowers at a Flower Market stall in the town of Nice in the Provence, France. 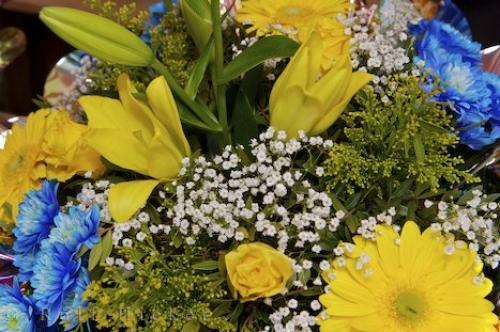 Yellow daisies, lilies and roses mix beautifully with the blue flowers and gypsophila. The Cours Saleya is the site of an enticing vegetable and flower market during the day in the old town sector of Nice. An array of bouquets are available of fresh or dried flowers, and potted plants. The aisles of the market place are bustling with locals and tourists by day and at night the Cours Saleya transforms into a lively area with packed restaurants. Bouquet of flowers at the markets, Cours Saleya in Old Town Nice, Provence, Cote d'Azur, France, Europe. Photo of a pretty flower bouquet at the Cours Saleya Market in the city of Nice, Provence, France.